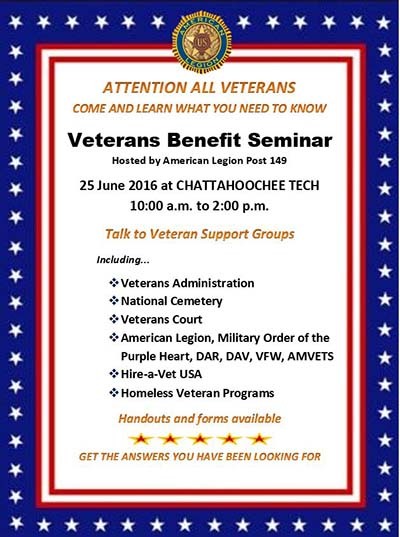 All military veterans young and old are invited to participate in the American Legion Post 149 sponsored veteran benefits seminar to be held at Chattahoochee Technical College on Saturday, June 25th from 10:00 a.m. – 2:00. The seminar will feature a panel of experts in all areas of veteran support including representatives from VA, the National Cemetery, Veterans Court, Homeless Veterans Programs, Veterans Transition, Hire Hero’s USA, Georgia Dept. of Veteran Services, Community Resource Referral Center, and CARES. Each speaker will highlight their area of service to the veterans and then field questions from attendees. Opening comments will be made by Representative Doug Collins. Collins, a veteran with two tours in the Middle East, will provide informative updates on Congressional actions concerning veteran legislation. In addition to the veteran support groups, local military organizations including American Legion, Military Order of the Purple Heart, VFW, DAV, Marine Corps League, DAR, and North Georgia Vets will be available to answer questions and accept membership applications. If you have questions concerning the seminar or other veteran needs, please call the legion hotline at 706-253-1715 and leave a message. Someone will return your call as soon as possible. Or you can email you questions to americanlegionpost149@gmail.com.